The rosemary add a very nice flavor to the crust. Another good recipe. I liked the combination of spinach and mushrooms. I used cottage cheese instead of ricotta, and reduced the other fluids a bit. The tart turned out fine. A light tasting, but filling soup due to the barley used. I do think it might benefit from either using all broth, rather than more than half the liquid being water, or from more intensive seasoning; Probably would work well with dill, basil, or marjoram. Makes quite a large pot of soup. This is delicious - very complex and interesting. At first, I almost skipped using clarified butter because it seemed like it shouldn't matter. I think it does though, because it lets the curry powder bloom or caramelize or something. This was a refreshing, lemony salad, very nice for a summer's day, and quite filling when accompanied by good bread and cheese. I used frozen corn, but certainly fresh would have been better. More parsley could have been added for my taste, or some other herb to give it a little more depth of flavor as it was just a bit ordinary tasting. Probably would be great to pack for a picnic. This vinaigrette has a strong flavour, and works well with grain salads made with bulgur or farro. Made for Tea '17. I made mine mini size so 18 to a batch instead of 8. I misread the recipe and therefore had to add the sugar at the end (because I didn't realize this counted as one of the dry ingredients. This did not appear to affect the outcome as they were still light and airy and pleasantly sweet. Both Claire and I approved. Batter can be made ahead and frozen Baked from frozen at 400 for 12 minutes. The idea for this recipe is good, but next time I will use more ginger, I found the muffins quite bland. But the again I LOVE ginger, maybee it works for you? This is a great recipe for cream cheese frosting. I use this to top the carrot apple cake from Huckleberry's Cookbook. p. 289 -- I used my vintage enameled bundt pan that measures 10" across and the batter and large amount of apples just barely fit... I was actually nervous that it would overflow in the oven but it rose exactly to the top of the pan. Unfortunately, despite copious buttering and flouring it stuck pretty badly and broke when I was getting it out of the pan. I tried to cover it with the glaze but that actually made it look worse. :/ Still, my coworkers demolished this cake so I guess it tasted pretty good despite being ugly! p. 290 -- Great idea to add maple syrup to a confectioner's sugar glaze, but this came out a bit clumpy despite sifting and just didn't look that appealing on the cake. The flavor was good with the Apple Spice Bundt Cake from the same book though. A cookbook in the tradition of The Silver Palate and The Barefoot Contessa . . . In New York City, famous for its food and restaurants, locals are reverential about the bakeshop and café Once Upon a Tart. For more than a decade, they have been lining up at the store mornings and afternoons, waiting patiently for their signature scones, muffins, soups, salads, sandwiches, cookies, and - of course - tarts. And pretty much since the day the café opened, patrons have been asking - sometimes begging--the proprietors for their sweet and savory recipes. Good news: the wait is over. 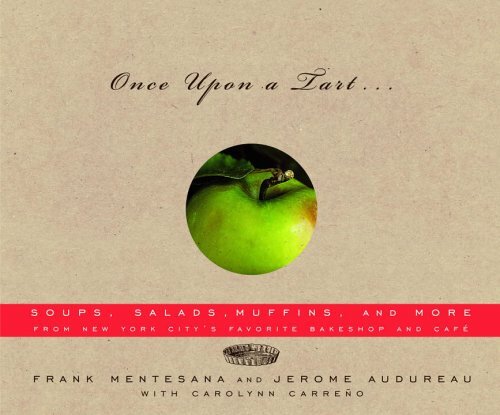 In Once Upon a Tart, the café's founders and co-owners, Jerome Audureau (a New Yorker via France) and Frank Mentesana (a New Yorker via New Jersey), go public with their culinary secrets ("We don't have any," says Frank. "That's our biggest secret of all") and recipes. They also tell their inspiring success story, from selling tarts wholesale out of a warehouse in Long Island City to opening their now-famous outpost in Soho. In nine delicious chapters ranging from savory tarts to cookies, the authors instruct and advise home cooks on everything from how to make the flakiest tart crust ("keep the dough cold") to making sandwiches ("condiments are key") to how to diet ("you want half the calories, eat half the scone"). Once Upon a Tart is packed with more than 225 easy-to-prepare recipes, including all the store classics that have earned Frank and Jerome the devotion of their customers: Caramelized-Leek-and-Celery Tart, Creamy Carrot Soup with Fresh Dill, Pork Loin Sandwich with Frisée and Rosemary-Garlic Aioli, Buttermilk Scones with Dried Currants, Banana - Poppy Seed Muffins, and Strawberry-Rhubarb Tart with Crisp Topping. Says Frank, "We believe that deep down, everyone is a cook." Adds Jerome, "And that a little butter in your life is a good thing."